“I love this little strip,” says Emma Bradshaw, co-owner of Rustic Gourmet on King William Street, Kent Town. Emma has taken a second with CityMag to walk us through her menu and suggest a few things for us to try at lunch. “It just feels natural, the mix of heritage homes and businesses and then the car places up and down it. It feels really lived in,” she says. CityMag is spending five days on King William Street, Kent Town this week. 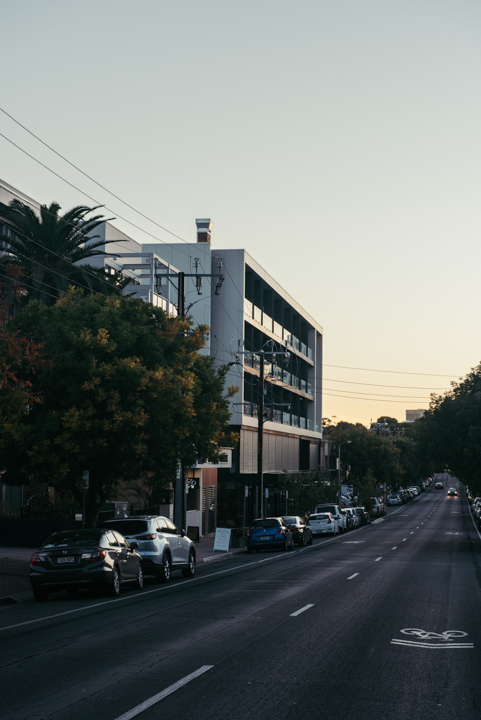 These profiles are part of a series called Mainstreet Week, where we look into the past, present and future of Adelaide’s neighbourhoods. Rustic Gourmet was the second tenant to move into the new Verde apartment and office block development on King William Road, Kent Town after Sarah Hansen Hair. Emma and her business partner, Katherine Nugent, had been looking for a second location to support their Tusmore store. The display cabinet is full to the brim with tarts and frittatas boasting delicious combinations of ingredients like chickpea, toasted coconut, kaffir lime, pumpkin and lemon tahini. We spy an Ottolenghi cookbook as Emma shows us through the generous-sized kitchen that does a lot of the prep for both the Kent Town and Tusmore stores. “Oh yes, he’s one of our absolute favourites,” says Emma about chef Yotam Ottolenghi. “We make the food that we like to eat – we always have and I think that’s what our customers respond to”. Rustic Gourmet is unique in many ways, not just for its home-style cooking and hearty meals. Emma says the business is built around an eat-at-home model too, where customers can buy a “large, to share” size portion of everything on the menu to take home and re-heat. When our lunch arrives, a delicious and large salad plate for $15.90, we end up chatting with the waiter about what she thinks people should order when visiting Rustic Gourmet. 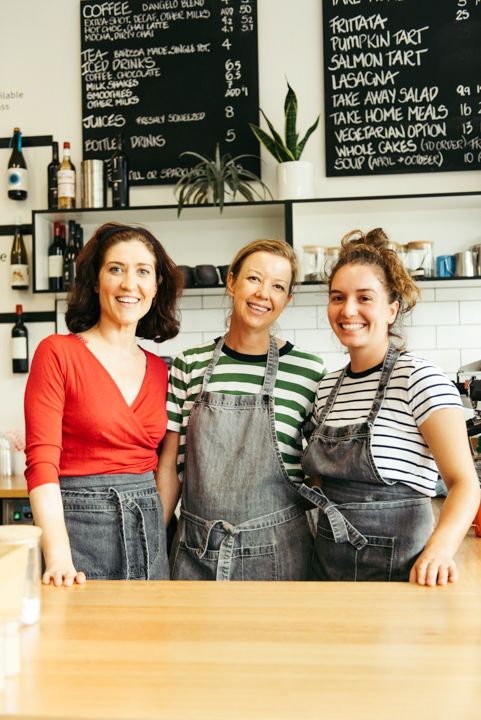 Co-owner Emma Bradshaw (middle) is flanked by two of Rustic Gourmet’s vivacious staff. The baguettes change regularly, she says, but the chicken piadina is a favourite, as is the egg & bacon roll available on Sundays. But more than just ferrying these items from the kitchen to our table, our waiter tells us that part of why she loves working here is that she gets to make the food too. “I made all those sandwiches in the cabinet,” she says proudly. Rustic Gourmet is that ideal sort of eatery so many people are looking for as a means to offset the meat-centric menus of so many old-fashioned restaurants. Here you’ll find vegetables at the centre of almost every plate and a warm and nourished feeling is the result.